Ingredients: Water (Aqua), Sodium Laureth Sulfate, Cocamidopropyl Betaine, Sodium Chloride, Dimethiconol, Fragrance (Parfum), Carbomer, Glycol Distearate, Citric Acid, Guar Hydroxypropyltrimonium Chloride, TEA-Dodecylbenzenesulfonate, Tetrasodium EDTA, DMDM Hydantoin, Propylene Glycol, PPG-9, Panthenol, Methylchloroisothiazolinone, Methylisothiazolinone, Blue 1 (CI 42090), Red 33 (CI 17200). Instructions: Wet hair, lather, and rinse. No need to follow with separate conditioner. Suitable for all hair types and daily use. Use with Suave Men styling products. For the price, you're not going to find a better shampoo/conditioner combo. They have different scents, and I make sure to occasionally switch back and forth between them. I bought this shampoo for my husband to try. He has used another professional shampoo for years but wanted a shampoo he could use that would be effective and less costly. I bought this on a whim and he loves it. He has grey hair which is thinning a little due to medication. He often has problems with shampoos, having to much perfume which cause him allergy problems and often times find that some shampoos leave his hair to soft, or make his scalp itchy. He likes this shampoo so much that he uses it almost everyday, and comments quite often how much he likes it. It is blue in color , some people don't like that, but he doesn't care what the color is as long as it works. The fragrance is light, fresh and clean smelling. No allergic reactions, no dry itchy scalp, and it leaves his hair clean, and not weighed down. The price is easy on the pocketbook. He highly reccommends it, and he's very picky about what products he uses on his hair. My husband uses this product. He applies a lot of gel to his hair, making it stiff to the touch, so that when he rides his Harley his hair doesnt move. This has been the only product that has cleansed every last bit of gel from his head, without drying out his hair. I ran out of my shampoo the other day and had to use his. I was impressed. My husband had been using a very expensive salon brand ( my shampoo) This works better. 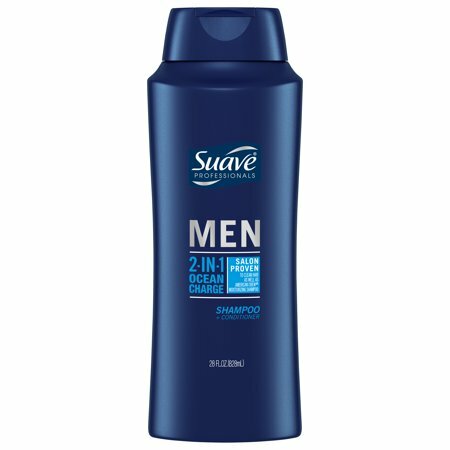 I too have recently switched to Suave. The whole line. Please keep doing whatever you are doing this has been the best product for his hair, and the best line at a GREAT price for the whole family. We have 2 boys left at home, they love this shampoo as well. We caught them sneaking my husbands shampoo. Teenagers! I WOULD BUY FROM HERE!